Create colorful compositions that capture the essence of Maine’s rocky coast and details of life along the shore. 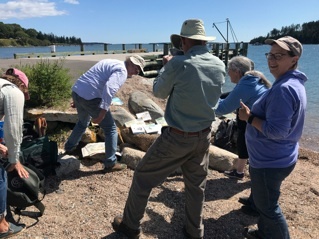 Each day we travel to new locations – boat yards, harbors, lobster wharves, quaint towns, islands, fields of wild flowers, granite ledges and more. Experiment with a variety of mixed-media techniques perfect for plein air: pen & pencil, watercolor, charcoal and pastels. You’ll develop color studies on location and also have time back in our “loft studio” to complete finished pieces using the media of choice. Amy offers multiple step-by-step demos each day that address a range of skills: novice students learn basic drawing, composition, perspective and color mixing; the experienced students are given challenges and advanced demos to develop new skills. In addition to the group demos, each student receives individual attention and personalized demos as they develop their work. Amy says, “I try to make this art experience both fun and a little challenge…for me as well as the students.” All levels of experience are welcome. 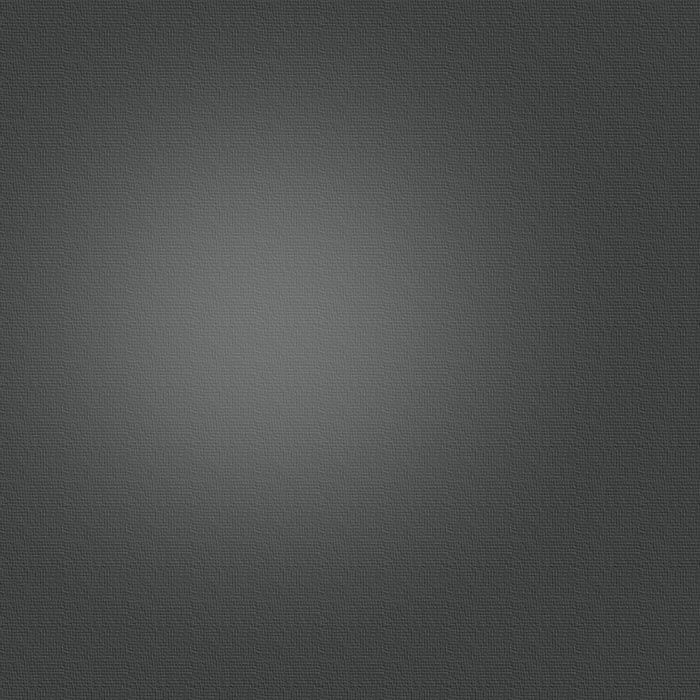 DAILY SCHEDULE: Orientation is Sunday evening. Classes run Monday through Friday, from 8am to 5pm, with an hour for lunch. ACCOMMODATIONS: housing, meals and campsites are available at the school, or students can find their own accommodations. LOCATION: The WoodenBoat Shool is on the waterfront, in a rural setting, just a mile down the road from the town center of Brooklin, Maine. 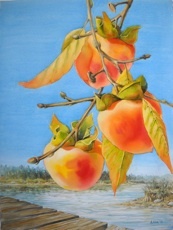 “Persimmons, California” was accepted in the National juried Midyear Show at the Butler Institute of American Art in Youngstown, Ohio. 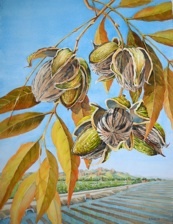 “Pecans, New Mexico” was exhibited in the California Watercolor Association’s National juried show in San Francisco, CA. Although they chose different paths, both mother and daughter have been professional artists their entire careers. 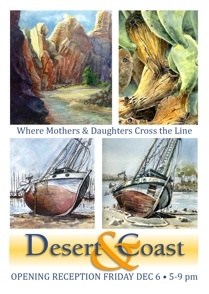 Desert & Coast: Where Mother & Daughter Draw the Line celebrates Flo and Amy’s life-long tradition of coming together to make art, either by sitting side-by-side to capture the same scene or by painting a similar subject while worlds apart. This exhibit of paired paintings and words is as much about how their art reflects the universal mother/daughter dynamic in life, as it is about the art itself.